1-Chloromethyl-4-fluoro-1,4-diazoniabicyclo[2.2.2]octane bis(tetrafluoroborate), with the formula C7H14B2ClF9N2, is a selective fluorine reagent which is white crystal at room temperature. It is mainly used asfluorinating agent to make single fluoridation with electronic double bond, silyl enol ether and enol lithium salt and so on. It can be used in the preparation of fluorinated steroid drugs, etc. 1. It is one of the most efficient and popular reagents for electrophilic fluorination. The product is also useful as a reagent, or catalyst, for oxidative transformations, coupling reactions and halogenations. 2. 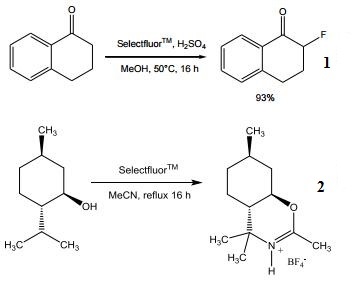 Useful for the direct electrophilic fluorination of ketones, ketals and enamides. 3. Ritter-type C-H amination of unactivated sp3. It is mainly used as fluorinating agent to make single fluoridation with electronic double bond, silyl enol ether and enol lithium salt and so on. It can be used in the preparation of fluorinated steroid drugs, etc. A highly effective and versatile source of electrophilic fluorine. Mild, versatile fluorinating reagent used in pharmaceutical and agricultural applications.